HAVE A BUTCHER’S: Sean Gallagher and Colette Twomey of Clonakilty Black Pudding in her shop in Clonakilty, Co Cork. COLETTE Twomey, managing director of the well-known Clonakilty Black Pudding company, has come to meet me, straight from addressing transition year students in the local secondary school. For Colette, it's part of "giving back". Like many entrepreneurs, she feels a responsibility to encourage and nurture the next generation of business leaders. "What did you tell them?" I ask. "I shared with them the story of our company and the lessons I have learnt during my years in business," she tells me. And her story is certainly an inspiring one. Clonakilty Black Pudding began as a small local business in the picturesque west Cork town of the same name, specialising in the manufacturing of traditional black pudding. Today, it has grown into an internationally recognised food brand whose product mix includes its original black pudding plus other meat products such as white pudding, sausages and rashers. While the business started in the Eighties, the story of Clonakilty Black Pudding dates back 100 years before that, when a woman named Joanne O'Brien first began making it. She used a secret recipe that is still used in the making of the pudding today. Instead of selling it directly to customers herself, she sold it through her local butcher's shop, Harrington's. "What is black pudding made of?" I ask. "It consists of beef meat; pinhead oatmeal, supplied by Flahavan's in Waterford; minced onions, grown locally by the Bandon Co-Op; and dried beef blood," she explains. "And a special mix of spices that remains a secret to this day," she adds, tightlipped and smiling. Colette grew up on a farm in Minanebridge, in Co Cork. It was here that she first met her future husband, Edward, who lived on a neighbouring farm. Growing up, a career in business was not on the horizon for the young Colette. She chose instead to complete a four-year course to become a brain-scanning technician. In 1977, however, the then 22-year-old abandoned her career plans and moved to Clonakilty, where she married her childhood friend, Edward. That same year, Edward took over the butcher's shop from his uncle. 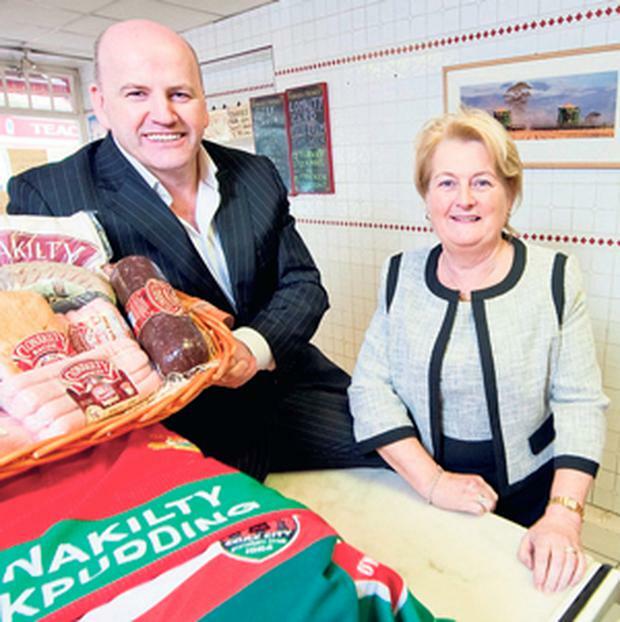 It turned out to be the original Harrington family butchers – and with it came the Clonakilty black pudding recipe which had remained a part of the business over the years. "Edward didn't have a background in the business and had to do a crash course," Colette explains. "His greatest attribute wasn't so much his butchering skills, but his people skills. He just loved people." He hired well-known signwriter Tomas Tuipear, who was synonymous with the revival of the traditional shop fronts in many Irish towns and, together, they devised a modern logo for the traditional pudding incorporating both the Clonakilty brand and the Harrington's name. Soon he began selling it to other butchers and local shops. "We quickly began to realise that we now had two businesses, the butcher's shop and the black pudding business," Colette tells me. In order to meet the growing demand, they bought a small farm and converted a number of outhouses on the farm into a production facility. Colette began selling the black pudding at agricultural shows, ICA events and at the annual spring show in the RDS in Dublin. "This helped build brand awareness in other parts of the country," she says. One of the company's first big breaks came when the owner of Cromleach Lodge guesthouse and restaurant, in Sligo, served the black pudding to a guest. The following week Colette received a call from the guest, saying that he would like to stock the black pudding in his shops. He turned out to be one of the directors of the Quinnsworth chain of supermarkets. "The business immediately took off," Colette explains. "We never really had a master-plan," she admits. "Edward's personality, his enthusiasm and passion for both the pudding and the business was more a vision than a plan. He wanted to make sure that anyone who liked black pudding as much as we did should be able to buy it in their local shop. We just worked to make that vision a reality. "The product went first and we built the business structures behind it as it grew." She remembers how the emergence of supermarket chains helped to create scale for the company. "Their central billing and distribution systems meant that we only had to deliver our products to one central warehouse location and the supermarket chain distributed it to all its individual stores throughout the country. Because we only had one van at that point, there was no way we could have serviced all these stores ourselves," she says. With a route to market clearly established, Colette and Edward decided to expand their range. They worked with food scientists from nearby University College Cork who helped them develop recipes for additional products such as white pudding and sausages. By 1992, with the business expanding and orders increasing, the company was caught for space. Improved standards in the food sector meant that manufacturing would now need to be carried out in a modern licensed facility. Because they couldn't afford to build one, and there were none available locally, the company moved production to a licensed facility in the Little Island industrial estate on the outskirts of Cork city. In 2005, however, tragedy struck the Twomeys. Edward became ill and passed away that same year. It was a terrible time for the widowed Colette and her family. She was faced with the unenviable decision of whether to hold on to the business or to sell it. She knew everything about making and selling pudding, but nothing about running a business. She also had to consider that one or more of the couple's three children might some day have a desire to take over the family business, and she wanted to ensure that they would have that option. With that in mind, she hired a business coach – whose advice would shape not only her decision, but the future direction of the business. He told her straight, "You cannot run a business by anybody else's style. You have to work to your own style." They were the very words she needed to hear. She decided to hold on to the business and run it herself. She was, however, determined to put her own stamp on it. "It would not be enough for the company to continue to do what we had been doing up to that point. We had to continue to grow and to innovate if we were to remain successful," she stresses. In time her confidence grew. She quickly recognised her own limitations and began focusing on her strengths. At the same time, she surrounded herself with a great team who excelled in areas she did not, like Marie McNamara, who has looked after the financial and administration aspect of the business for many years. Over time, too, eating habits in the country also began to change. She pays tribute to renowned chef Michael Clifford, who was the first to start using black pudding for meals other than breakfasts. He began a trend by including it as a starter in his menus. Soon, people began adapting the product and using it on toast and as a topping on pizzas. Her entry into the export market did not happen over- night. Instead, for many years, Irish emigrants who returned home for holidays would take Clonakilty Black Pudding back with them to their adopted countries. "They used to tell me it reminded them of home," she says proudly. In 2012, the company began supplying Tesco in the UK for the first time. She is quick to record her appreciation for the work of Bord Bia in helping to promote the business there. More recently, she secured contracts to supply stores in Dubai, Hong Kong and southern Spain. Last year, the company's turnover reached an impressive €13m, with exports representing more than 10 per cent of the company's total sales. Colette now employs 42 staff, including those involved in the butcher's shop, which she still runs on Pearse Street, in her adopted Clonakilty. "We receive emails, daily, from Irish people living in Australia who are trying to source our products locally. We are now exploring the possibility of partnering with a local manufacturer in Australia to make our products there, due to the constraints on the importation of meat products into the country," she tells me excitedly. In addition, she recently acquired a premises in Clonakilty and is in the process of developing a new manufacturing facility there. She intends to bring Clonakilty Black Pudding home to its original place of origin. Colette Twomey is an inspiration. Not only has her business grown but so, too, has she, as an entrepreneur and as a person. She has shown incredible bravery, resolve and determination in taking over and leading the company she started with her husband, Edward, more than 25 years ago. She has transformed a traditional cottage industry into a thriving international food brand. She has embraced change. And she has done so by continuously focusing on improving, innovating and scaling her business. We all need role models. And it is easy to see how Colette Twomey's story might well serve to inspire and empower the next generation of entrepreneurs. I have no doubt, too, but that her late husband, Edward, would be immensely proud of Colette and what she has achieved.